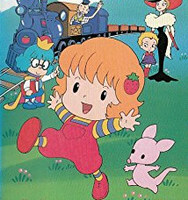 Plot Summary: Button Nose is a little girl who is home alone for a few days when a robot comes to gather strawberries. She is so excited by his spaceship she accidentally starts it, and goes on a voyage to his planet. When she lands she is brought before the king, who is a distant relative of hers and invites her to spend some time on the planet.